Great work, I wish you luck! Is this for sale? I am in the Ventura/Ojai area and would like to have a look. Thank you. nice but quite expensive for size!! I WOULD LIKE TO SEE YOUR BATHROOM, PLEASE. REALLY NEAT HOUSE. I would like to know if you have other designs and how much this one costs and weighs? I love it but,where is your bathroom? Really nice tiny house design, one of the best I’ve seen. I love this design also, and the attention to the touches of luxury. The pillows are scrumptious! I was wondering where the ladder to the loft is stored. great use of space, this is a winner design. would like to see the bathroom facilities. This is about as perfect as it can get. 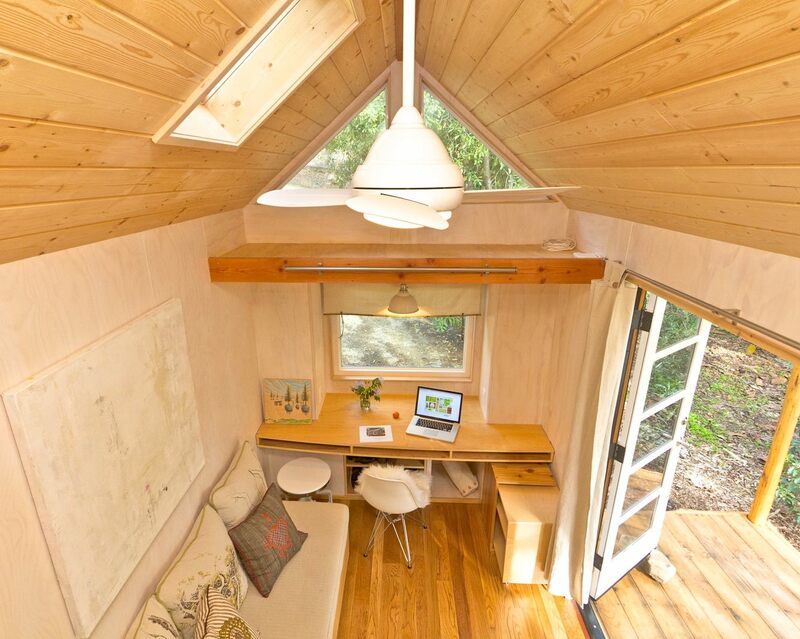 The first tiny house I truly covet! Excellent work! Beautiful and filled with light. Where did you park it? Ok, THIS I could live in “til I die.” Beautiful and comfy! I’m wondering… why does it cost so much? What costs 35k? The materials, the work? Seems a lot for such a minimalistic house. Of course I’m looking at it with the eye of a Bulgarian, where we can get 7 solid houses for the same money but I’m just curious how come this place costs that much. from what i understand, it the labor, many tiny houses are diy, but having it made, as i am assuming this was by professionals will double the cost. its seems expensive but considering how much money you save in maintenance and not buying furnishings and other stuff in the future is where the savings come in. 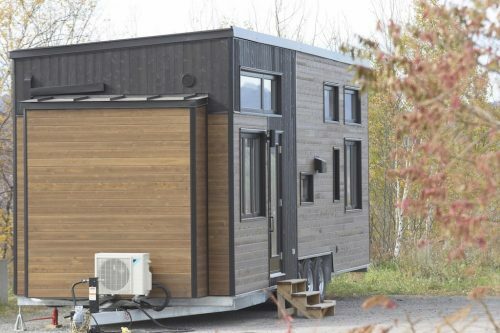 most importantly its looks well built, i dont know how long these tiny houses are supposed to last, but considering how nice this one is i think its a bargin, the cost of a luxury car here in the us. i guess in bulgaria it could be made even cheaper. What I am trying to figure out is the walls, its that sheets of some kind of white wood or is it wallpaper or sheetrock? the beautiful walls make the wood features really pop. The choice of staining the wood a light gold was also clever. I dont like on overly red or dark stains unless its done by someone who knows what they are doing. Such a beautiful cream and golden sheen in this house. The interior walls were one of the challenging parts of the project! The walls are made out of plywood panels with a whitewash finish. I wanted to have white walls to contrast the wood ceilings and floor, but still have the wood grain of the plywood show through. The whitewash is an all-organic aqua resin product from Germany. Very nice product but a bit pricey. The white color reflects light and feel more spacious. The plywood panels give additional shear strength to resist movement during travel. Nicely done – would love to see shots of the bathroom, floor plan and ladder type used. Nice. More photos please! I’d like to see the fireplace, bathroom, kitchen and closet details. Very clean design. We like the desk area and exterior with vertical application. Wonderful build. I love your house!!! It is simply beautiful. I especially love that it is self-sustaining. That is one of my new goals for the future: live in a tiny, self-sustaining home. Perfect, love this. Hope to have one someday! How do you find a place to put the house? fire? what fire? there have been wood houses in forest areas for thousands of years. at least it being on a trailer she might have time to move the house out of the way. Hi Diana- Great question about the fire! I have a fire extinguisher, and smoke/ carbon monoxide detector. I also have a second means of egress (exit) off the bedroom loft with my large skylight. It fully opens so I can escape in case there is a fire downstairs. Can I buy plans for this house? I love it! But where do you put clothes and other personal belongings, like, shoes, purses….etc….? Beautiful home. I love the sense of luxury you have while still being able to live off the grid. Love this! How do I get plans for one? Its adorable but cant believe 35K we are building a cabin 22×40 in maine for less than half of that. none the less … its cool ! My thought exactly. The highest dollar figure I’ve seen for a tiny house. Tiny space, very big price. This is super nice, I love the minimalist style. Amazing design sense. 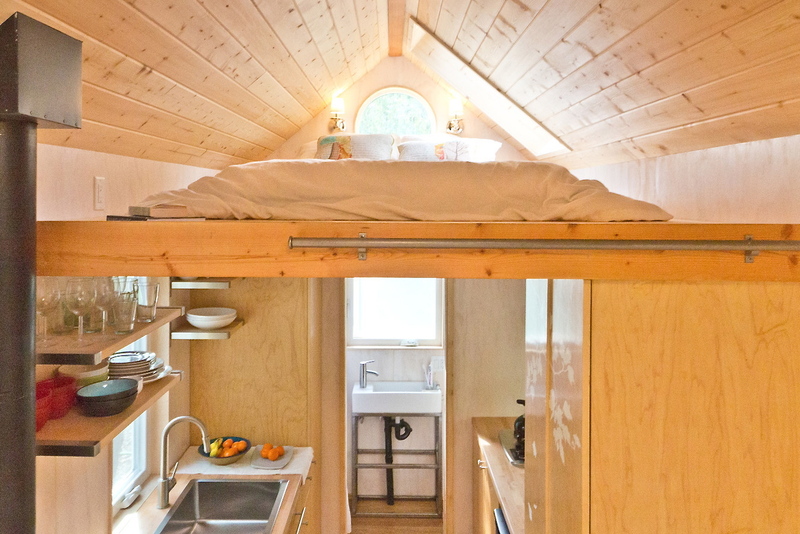 This is another new benchmark for the tiny house movement. I have been following the tiny house movement. I am intrigued. Less is definitely more. 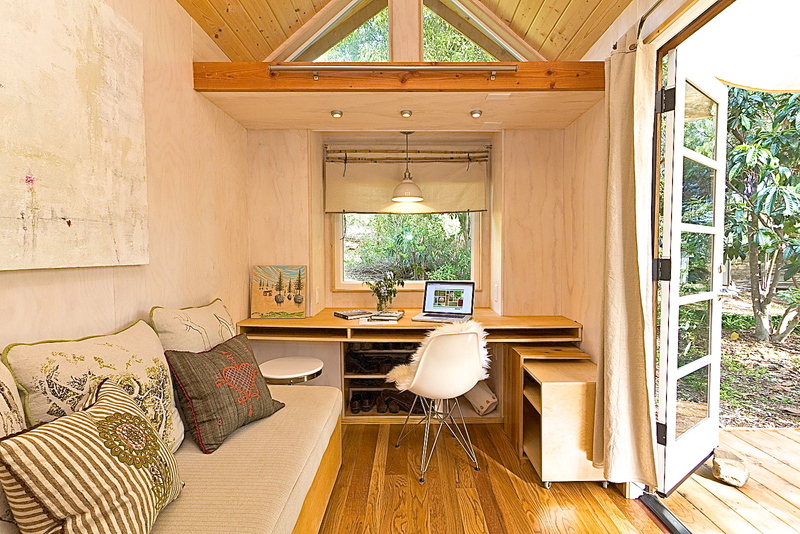 I love, love this tiny home and it’s by far my favorite. Thank you all so much for your kind words! Craig- I understand that the cost is high for some, but I built this house so I can live in it forever. It’s built with the high quality materials and professional labor. It’s off the grid with solar panels and includes the built in furniture. I hope that helps. Feel free to email me for any questions! how can we buy one like this! ?? Where can I purchase the plans? This is exactly what my husband and I are looking for. However, we would like to put it on a permanent foundation. I can easily design it for a foundation if interested. Feel free to contact me. Thank you! What you’ve given us to see is fantastic. The french doors to the outdoor deck in my opinion is mandatory for a tiny house. It expands the feeling of the living space – and if you are located in a mild climate – it literally does expand that space. I’d love to see more views of the kitchen and bath. 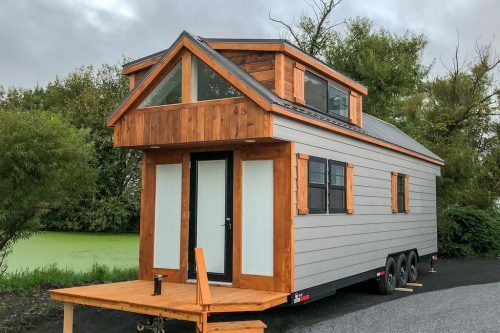 Is it difficult getting insurance on Tiny Houses like this? So beautiful Vina! Im building one at the moment which has such a similar feel. Love it. How do you get up to the bed? I didn’t see a ladder or stairs of any kind. Really cute place! I admire people who can downsize their lives like this. Way to go. There is a rolling ladder on the rail which can access both lofts. I love, love, love this. Gorgeous design and talk about living simply. I’m sorry you didn’t include pics of the bathroom and shower. 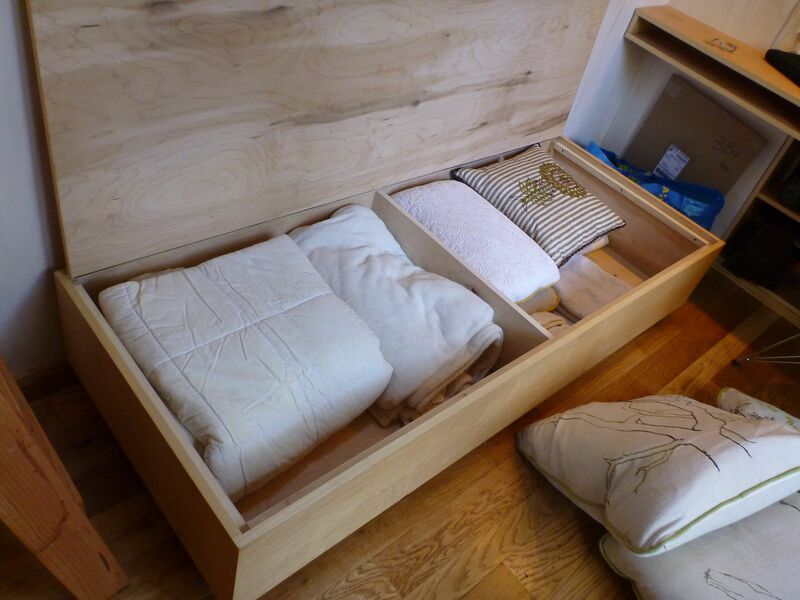 Love the storage under the bench seating. 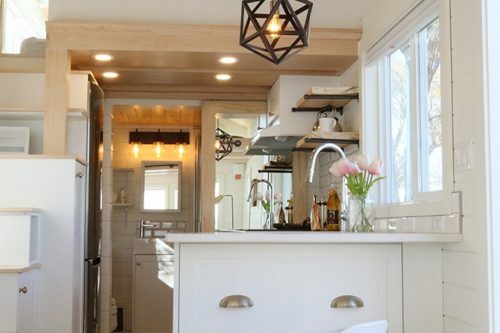 I love your tiny home thank you for sharing this nice simple design and clean lines did not see the kitchen or bath but loved what I did see. It’s beautiful, light. airy a really nice layout. Your tiny house is beautiful! Great job! It’s charming, self-sufficient and homey! This is lovely. Good for you. it looks simply perfect to me and thank you for your comments. Beautiful small home design, Vina. Do you own the land where you park your tiny home or are you renting from someone else? 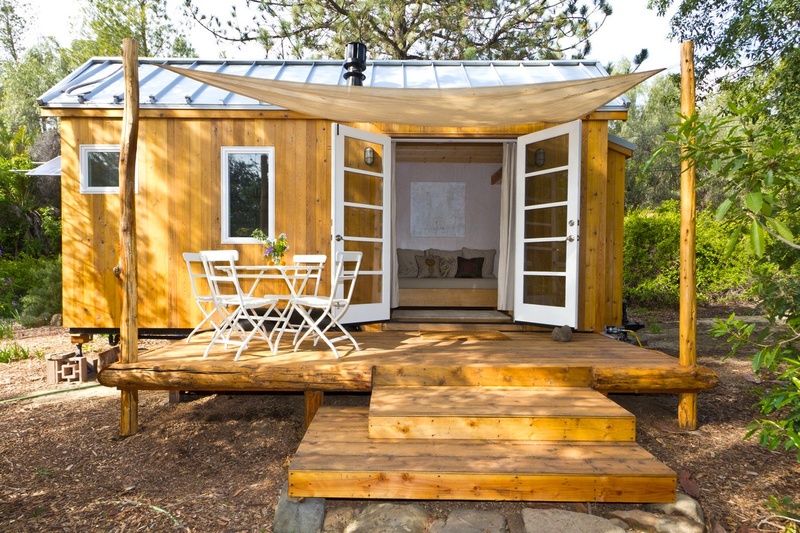 Is Ojai flexible concerning tiny homes on wheel? Hi Shawn – I rent the property on the land. We’re trying to create a tiny house community in Ojai but navigating zoning guidelines is challenging. Other cities have done it, so we can use them as a model. I believe it is a solution to address affordable housing and environmental impact. I have been looking for some time now , but what got me was the quotes you had printed of John Muirs writings on those pillows. That just brought tears to my eyes and knew this is pretty close to the one I want. I have some of my own ideas. I am disabled and living on fixed income and also cannot be climbing a ladder to bed. I also want to have shower walk in tub, and cork floors. I have a settlement coming but it is not enough build a 35 G tiny house. I also cannot build it myself due to my disabilities. How did you get help and who could I contact to help me. I would want to help build it )whatever I could do) I would like to somehow how get mine built and get some land (some how?) and make a community of them. How long does it take to build one? Your is very nice I look every night trying find a solution, and get more ideas. It’s in my head but I can’t get in on paper. And the biggie ?Where can I put it to live in it and not own my property. I just spent 24 years up in the mtns. in Nor/Cal but even up there I would be snowed in or and the Forest service would run me off, and I have no truck to haul it either. Do you have someone haul yours for you? You did an awesome job girl!! Hi Tracie – I’m so glad you noticed the beauty and writings on the pillows! I had commissioned a local artist friend to collaborate with me (Alicia Morris Soto in Ojai) on the textiles. Since the theme for the interior was “trees” and I had a love for Yosemite, Alicia incorporated the writings of John Muir on the pillows. She (painstakingly) hand embroidered the trees on the writings. Beautifully done! Beautiful design. What does the $35k include? I was curious what the total cost would be for plans, materials, and labor. Thanks! I love your design !!!! I have been studying all aspects….can you just tell me what the height of the loft and overall ceiling come to? Great job on the tiny mobile home. Just a quick question, how do you connect electricity, water and wifi to your home? I’m from Malaysia and mobile home is not popular in our country. Beautiful. Here we can really see how the thoughtful placement of windows and doors, a limited & consistent palette and the deft selection of materials helps promote the subconscious sense of spaciousness in a very tiny footprint. A case study! Hi Vina. I saw this a couple of years ago. Are you still living there? My mom lives in Ojai and I’m in Ventura. I’ve always adored your cute little place! Problem A: Sure, bigger & cheaper places with cheaper particle board or sheet rock walls you can’t hang pictures on exist. Solution A: Many people use more expensive materials & woods in tiny houses, increasing the cost. Increasing warmth. Increasing personality. Micro mansions. Problem B: Bigger houses are harder to go off-grid because they are bigger & require far more energy to heat & cool. You slave away to pay. For what? Solution B: Tiny houses are far smaller, so they can be heated & cooled with solar much easier. Saves tons of money in the long run. Less slaving, more saving! Problem C: Bigger houses require more upkeep as they get older, which increase expenses. Solution C: Tiny houses are easier to heat, cool, clean, wash, & re-paint if needed. Fewer headaches, more time saved! Problem D: Tiny houses are so narrow. Solution D: Great for mobility. Otherwise, go wider. 10ft wide is a good start. Many use trailers to avoid zoning conflicts. Problem E: Tiny living room is too small. Solution E: Use tiny kitchens, bathrooms, increase size of living. Place kitchen at end, not running entire length of the tiny. Second living room couch loft. Problem F: Need guest beds. Solution F: Create a dual, or even a quad bunk bed loft. Dual lofts, second living room loft in center. Google images has excellent ideas. Problem G: Need more room for full size beds. Solution G: 3 steps to enter living room. Bed below couch/living area, with another bed or living room in the loft 8 ft above. Use upper & lower spaces (Floor “loft”). Problem H: Not enough storage. Solution H: Try using built in floor to ceiling shelves. See TumbleWeed Tiny Houses for great starter ideas. Problem I: Reduce electricity use. Solution I: Tiny house is already small & easy to heat. Use propane/wood fireplace/ceramic electric with thermostat/rocket stove for heating/cooking. Problem J: Fridge/kitchen is too big. Solution J: Go tiny. Use tiny electric/ceramic/induction hubs/convection toaster ovens/tiny cube fridge. Going tiny ensures little waste/thrown out food. Problem K: Reduce water use. Solution K: Composting toilet/Altered Nozzle uses 50x less water so you may need a 10 gallon tiny water heater. Tankless may not generate enough water flow. Problem L: Tiny doesn’t look like a house. Solution L: Create rooms similar to other trailers. Use divider panels for rooms. You can do it. If you manage space wisely. Problem M: Freezing weather/frozen pipes. Solution M: Bundle every water device close together. Shower/Sink/Washer/Fridge (Ice/water models). More reliable, less to break. Less waste, faster hot water. Problem N: Hate climbing stairs. Solution N: Create winch powered steps/elevator/escalator. Rope ladder/mini trampoline (jump into loft)/climbing wall/recessed steps. Get creative! Solution O: Use 12v devices/dimmable LED/skylights/big windows/air dry clothes/pedal powered washer/pedal powered sink/tiny appliances. Get creative! Solution P: Large windows that can be opened/tiny ceiling fan & light combos/central mounted AC unit/Move tiny under or near low growing shade trees. Solution Q: Off-grid grey water plant watering system/Use baking soda & other non-toxic cleaners/Water filtration system/City water, if needed. Solution R: Grow your own coconuts/almonds/walnuts/pecans/apples/oranges/cabbage/collards. Eliminate waste & pesticides by growing in your own greenhouse. Problem S: Need better food/water storage options. Solution S: Slotted wall shelves where you put food in at top & it goes to bottom. Old is eaten 1st. No manual cycling through food. Add food/water storage shelves. Problem T: Prevent food from going bad. Solution T: Order dehydrated food from prepper websites. Problem U: Remote dry areas. Solution U: Drill well/roof rain catchment system/systems to convert morning dew to drinking water exist also. Problem V: Overcoming “regulations” against tiny houses. Solution V: Remind them the environmental damage of using 10x more material for larger houses & how tiny houses conserve trees & resources. Problem W: To many windows/no privacy. Solution W: Use tinted or mirrored 1 way windows/curtains/shades/Japanese style rice paper partition walls. Problem X: Energy “vampires” such as clocks on microwaves/vcr/tv that stay on even when turned “off”. Solution X: Install power outlets with on/off switches. May save 30% power or more, depending how many energy vampires you have. Problem Y: Ideas for less power consumption. Solution Y: Paint bathroom walls with glow-in-the-dark walls/use glow-in-the-dark power switches/low voltage LED night lights in strategic locations. Problem Z: Need more sitting space. Solution Z: Use tiny/custom/folding tables/chairs/spiraling couch that goes around & around from floor to ceiling, generating 2x, 4x, 8x more sitting space. This is impressive for the amount invested! For 35k in my estimation it’s a grand slam. 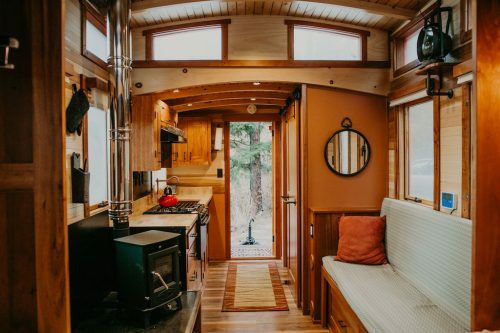 It would appeal to a very wide group of people looking to make the move into a tiny home. Great design and craftsmanship! Impressive.